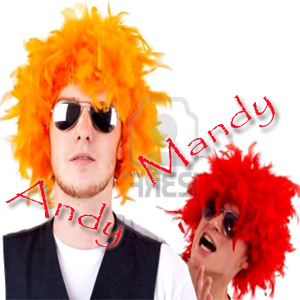 Andy and Mandy roam in a shopping mall and Andy comes across someone. Andy goes to a beautiful girl who was standing with a smart boy. Andy - (to the guy)Abey Sale , kya haal hai ...yeha kya kar rahe ho tum do..
Girl- How dare you call me Sweety and baby?. Who are you? Guy - (Slaps Mandy and Punches him ) How dare you call my wife by such names? Andy - Bhai tune us ladki se batameezi kyun ki. Mandy - (holding his swollen cheeks)Bhai , I did the same what you did to the other girl and the guy next to her. Andy - Idiot...she is my fiance and that guy is my future brother in law.